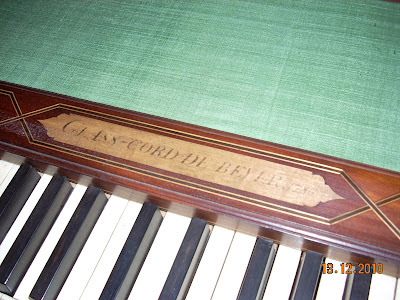 Glasschord or Glass Harmonica made by Beyer, France, 1786. Made in France for the aristocracy and as a decoration (Transvaler, 28.1.66). 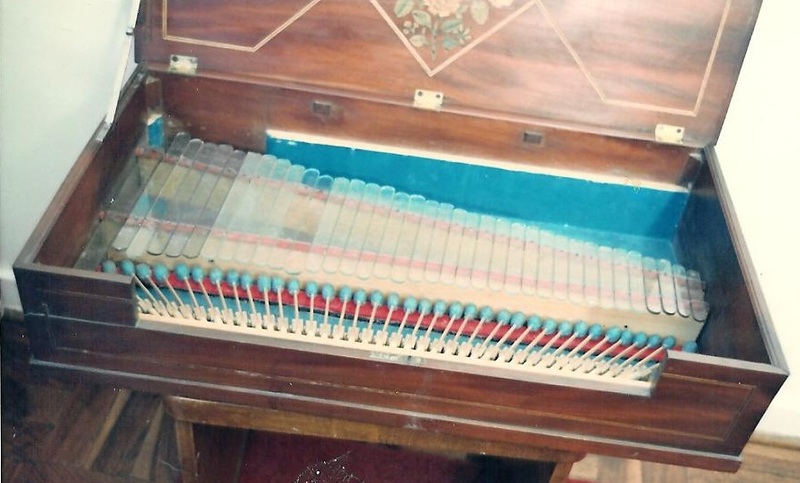 Very rare, played like a piano, but the tune comes from slivers of glass instead of wires. 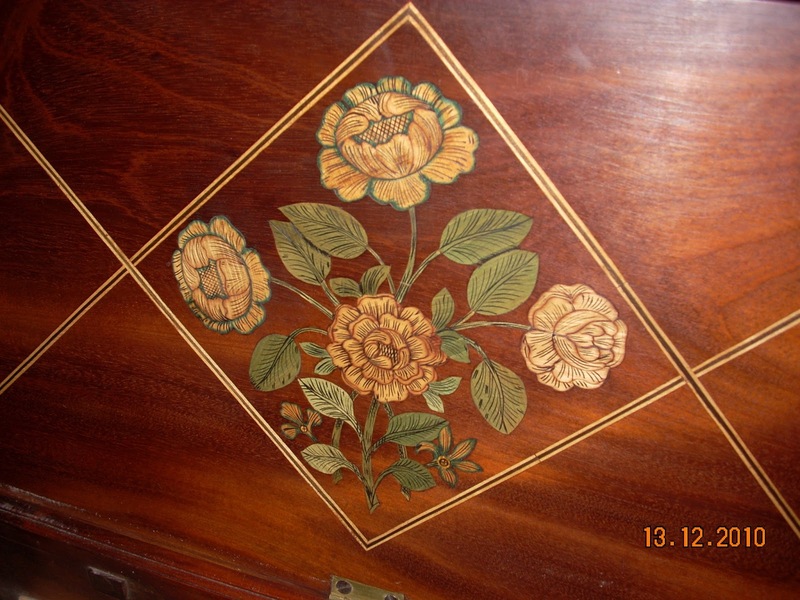 Bought in France in a very old music antique shop (Star, 12.11.59) Hans Adler has only seen two others, one in a private collection in France and one in the musical instrument museum in Vienna. Their fragility accounts for their rarity. 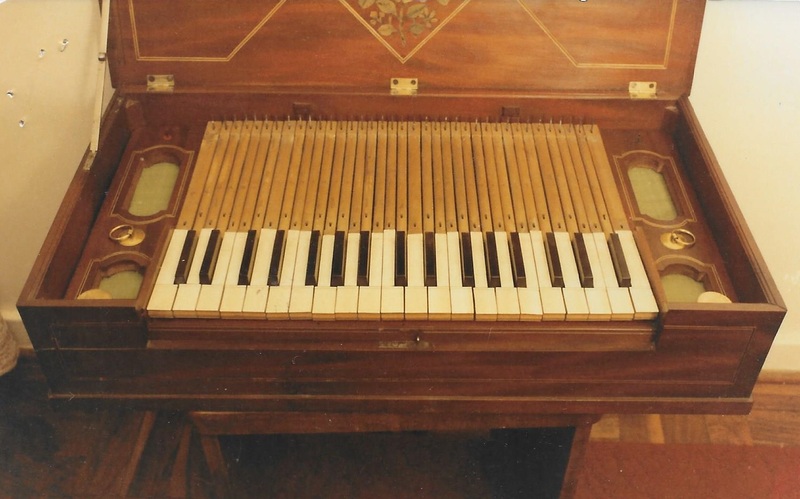 Mozart composed music in 1791 for such an instrument, a variant of which was played in his time by a blind musician, Marianne Kirchgessner. The sheet music - an Adagio in C and an Adagio and Rondo for a glasschord, flute, oboe, viola and cello - are in the Adler music library. Two-and-a half by one-foot instrument, mahogany case, three octaves of notes which act on hammers with heads of green leather as large as olives. These strike a glass xylophone and produce sounds more limpid and sweet than those of a celesta. Glasschords originally consisted of glasses filled with water to varying levels to produce the notes of the scale. Sound was produced either by hammers or the wetted fingers. Benjamin Franklin, when he came to England in 1757, became interested and mechanised it by using self-tuned glass bowls. He called it "Harmonica". The instrument was later replaced by the celesta. Permission for export had to be granted by the Musée du Louvre, which checked if there was one left in France. solo performance as well as for accompaniment. Is there anyone out there making reproductions? Wondering how much would be the price today?